I was pretty productive this week. 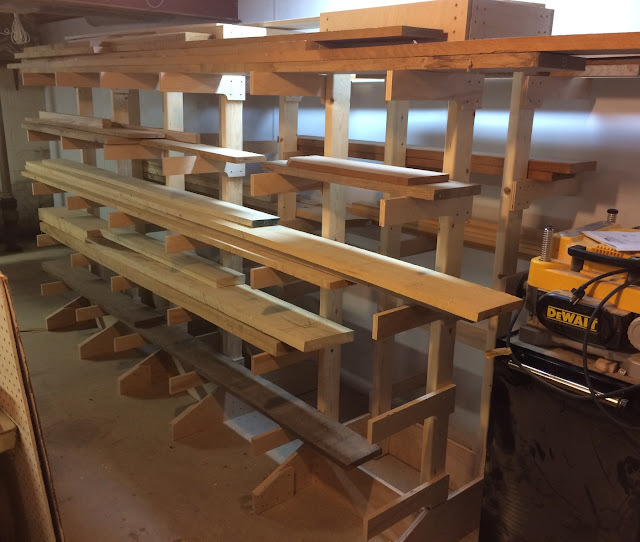 A few late nights and next thing I knew the lumber storage racks were finished. I tried a number of short-cuts along the way and some of them worked and some of them didn't. 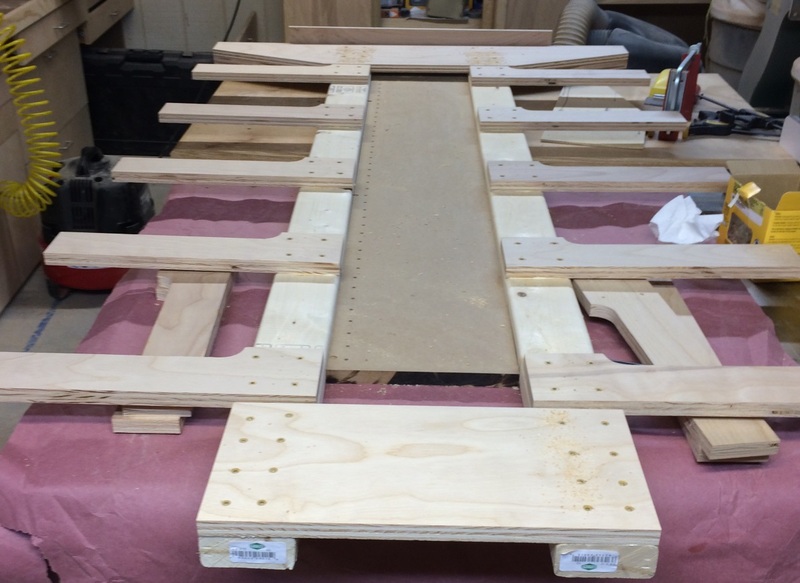 The first step was to assemble the short side frames using glue and 1-3/4" screws. You can see from the photos below that there are a lot of screws in each side panel. Sixteen in the foot, forty holding on the arms and another sixteen in the short top stretcher for a grand total of seventy-two screw. That's not counting the additional twenty screws per side to attach the long stretchers to each short-side frame. Since I am building six of these I'm going to end up needing close to 600 screws. 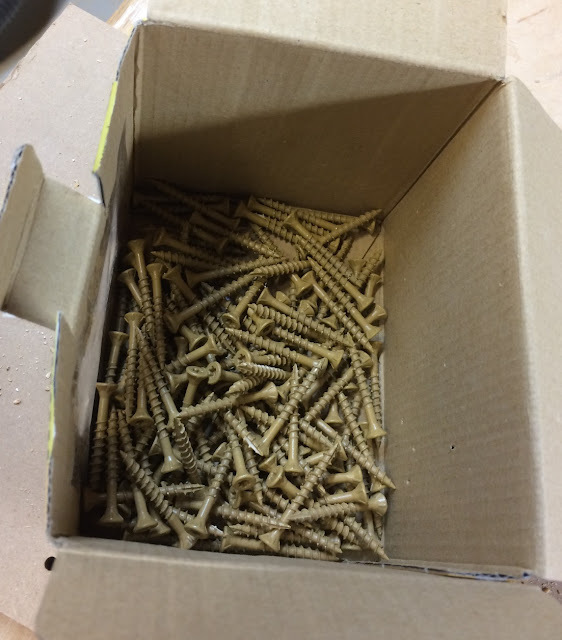 I knew a single pound of screws wasn't going to cut it so I bought a five pound box. 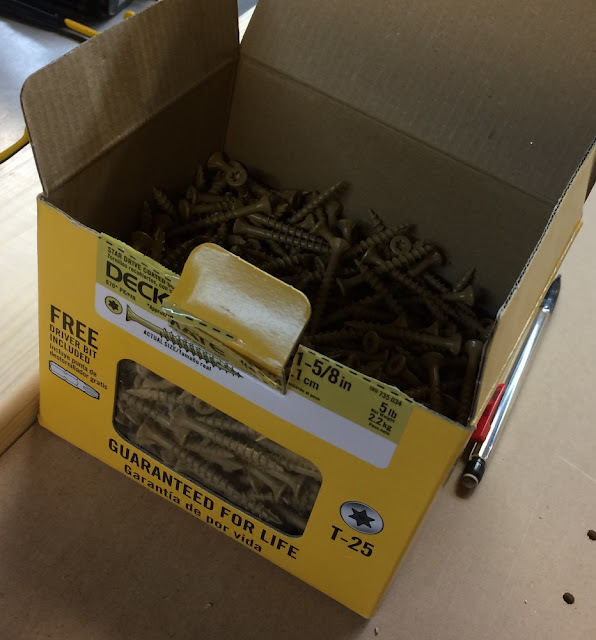 Yes, deck screws... Why deck screws you ask? I use deck screws quite often in assembling my workshop projects. They are strong, they are coated to resist moisture and while my basement isn't wet it isn't bone dry either. 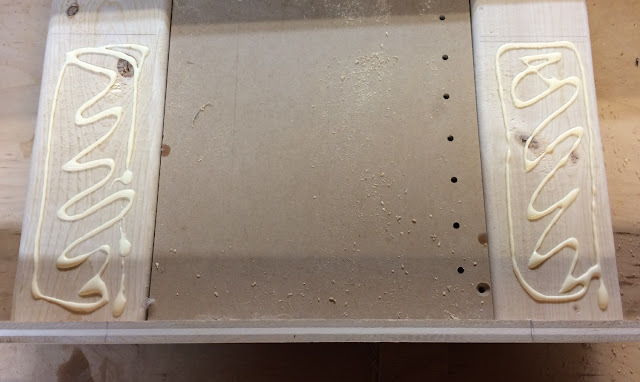 These have flutes to allow them to drive their way into soft wood without needing a hole pre-drilled and they have enough bite they can pull boards together. The plans didn't contain much useful information in the way of how to assemble the racks so I made up a couple of jigs and spacers to help with keeping things square and spaced consistently. 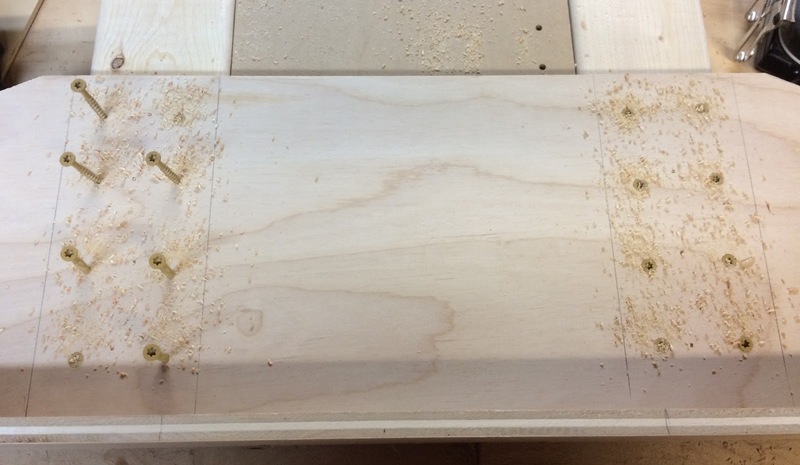 The principle jig was a scrap piece of MDF ripped to fit the spacing between the 2x4s. 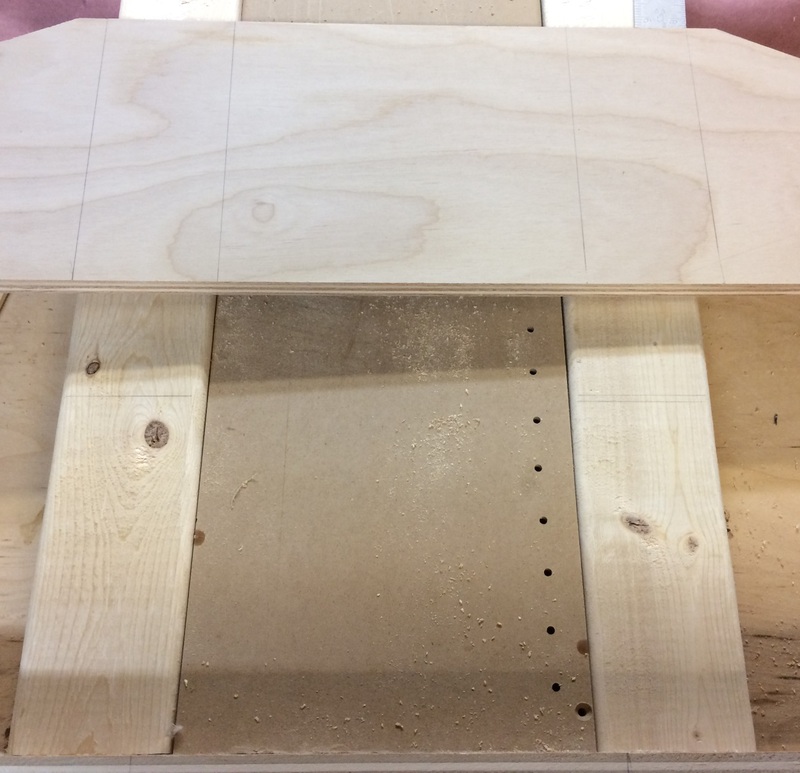 I attached a piece of 1/2" plywood to the bottom sized to assist centering and attaching the foot square to the posts. The plywood base to my squaring jig is sized to fit evenly between the toes on the feet. To start I laid out two 2x4s using the MDF to space them appropriately. Then I set a foot on top using the jig base to space it evenly. Then using the foot and a framing square I marked the height of the foot on the 2x4s and the 2x4s on the foot. A little bit of glue on the posts using the markings to keep from getting the glue all over everything. After replacing the foot I used a couple of brads to keep everything lined up while I predrilled screw holes and screwed everything together. The plans didn't really specify the spacing between the bottom most arms and the foot so I decided to minimize the spacing and used a 1/4" piece of plywood from my scrap bin as a spacer and another piece of plywood as a straight-edge to keep the feet in line. Again I added glue to the back of the arm then a couple of brads to hold the arms in place then drilled pilot holes and screws to hold it all together. 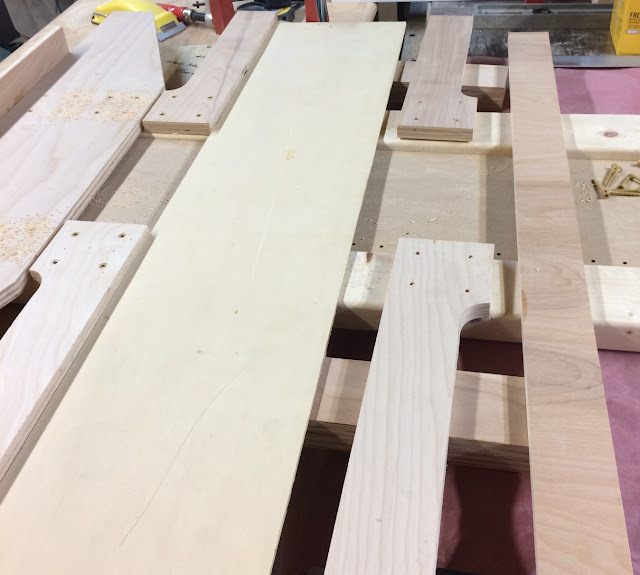 I made another 1/4" plywood spacer to set the spacing between each set of arms. I followed the same basic process: spacer, add glue to the back of the arms, pilot holes then screw the arms in place using a straightedge. I followed this process for the rest of the arms. When I got to the short stretcher on the top I just lined it up with the tops of the posts then glued and screwed it in place. The two halves get assembled with screws only so the racks can be disassembled later. Since I was sloppy with adding the glue I had a lot of squeeze out which meant I needed to wait a day for the glue drips to dry. I also tried different ways of assembling the two halves using the long stretchers - also no tips in the instructions. 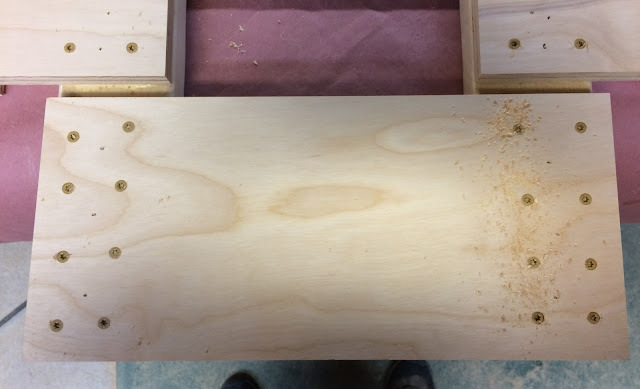 The way I found that worked best was pre-drilling the pilot holes at the drill press. Then attach all four to one of the sides using a single screw. Then with that side braced against something align the other side and tack them together with screws top stretchers first. This leaves the assembly somewhat stable but still flexible enough to get everything square. Using a framing square I made sure the assembly was square then added the rest of the screws to lock everything in place. I did most of the assembly during the week so Saturday I lined the racks up against the long wall in the smaller shop (I've got to make another diagram and post it). I used a couple of shims to make sure they didn't rock and were somewhat level with each other. I didn't glue the shims in place because I may want to move them later and don't want to have to chisel them off. I considered adjustable feet but the best price I could find on those was $16/four and didn't feel like dropping another $50 when some wood shims would work. 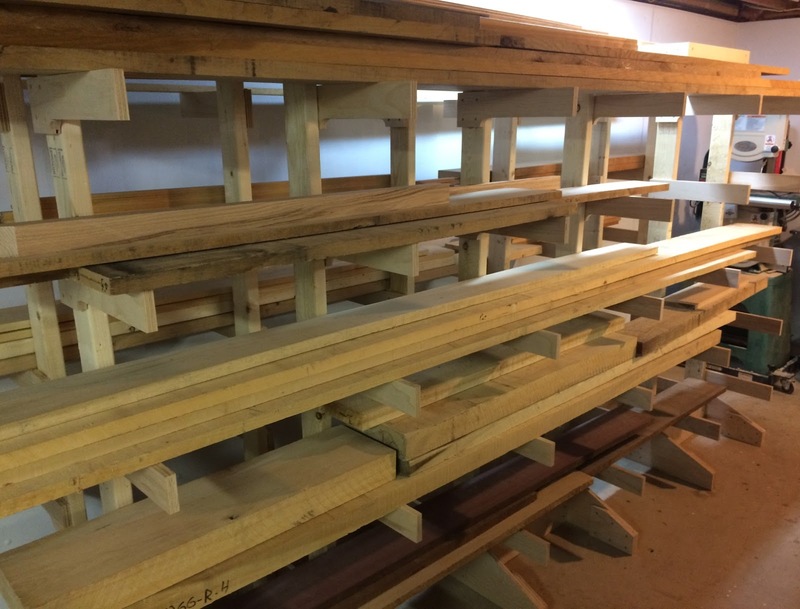 My plan is to use my old lumber rack for special wood and wood for in progress projects. I moved everything else to the new racks. Yay! Another project off my workshop bucket list. 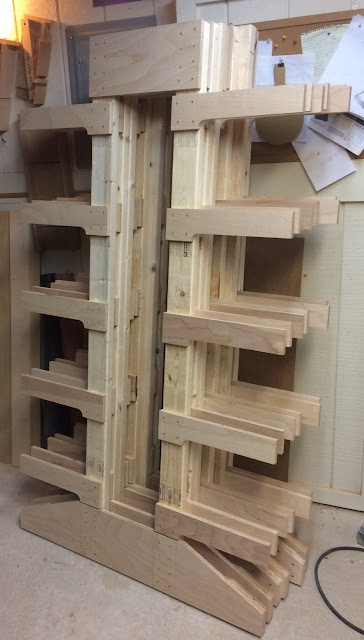 Compared to most projects I get from woodworking magazines these were somewhat minimalistic. They were sufficient but missing some values. For example the width of the arms wasn't given. There were enough values given that I was able to make a reasonable guess (~4" btw). There wasn't a template for the arm shape nor were there dimensions given for the cut-outs (I guessed 1" and just made a 1" radius scallop at the junction. It seems to be working fine. With that said, I found the plans were quite sufficient and well worth spending the $3 they cost me. The finished stands are quite sturdy and I would have probably over-engineered my own design. I don't regret using pine rather than poplar for the stands. 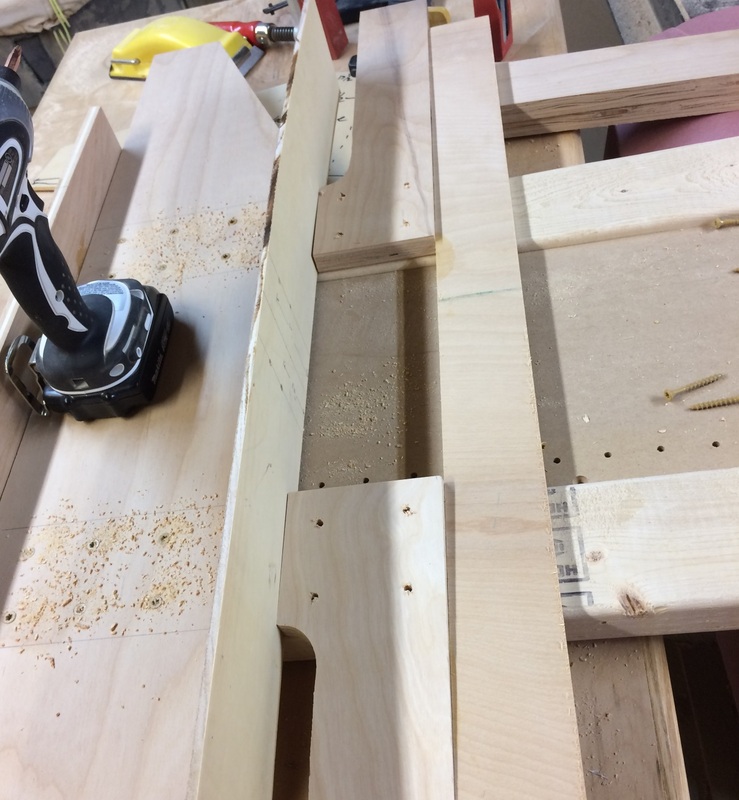 I was able to find relatively straight and untwisted 2x4s so they were a lot cheaper than buying and milling my own poplar. I spent maybe $2.50 / post using 2x4s versus probably needing to spend close to $10 / post. I do think that if I were to make these again I'd use cheaper plywood. My local DIY store has some very nice 9 ply pine plywood. 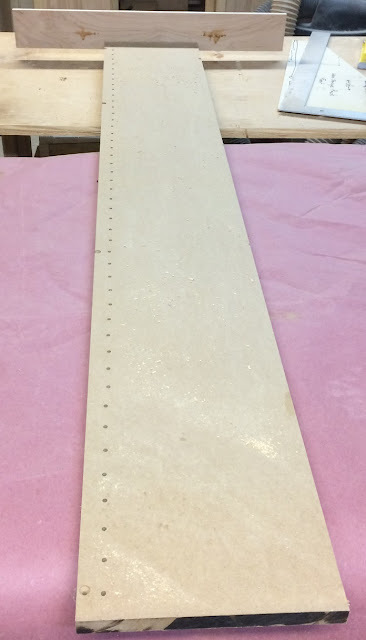 I used birch plywood because I wanted to use hardwood (hopefully stronger) but I'm thinking the pine plywood would be strong enough and I would have saved a chunk of money (enough to buy my levelers anyway). All in all I found this to be a quick and easy project with a lot of utility. 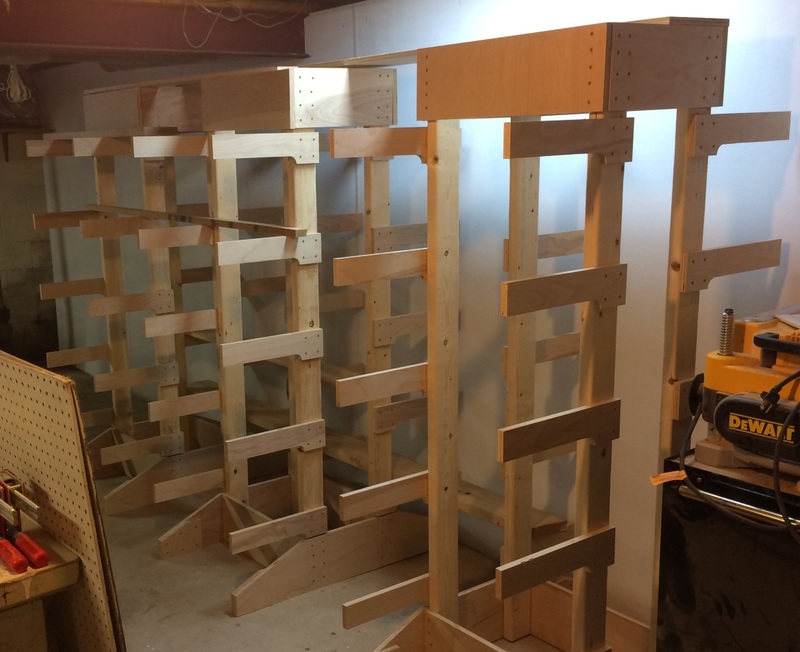 I'm quite happy with the plans and recommend them to anyone who wants a free standing lumber storage rack. Oh, and did I mention that I used a lot of screws? Almost 4 lbs of screws!